this is happening this friday 2-8 at 9pm, iBeam. playing trio music with Masa Kamaguchi on bass and Gerald Cleaver on drums. Brooklyn Music For Two Pianos Concert Series.2 continues in late january!!! !! I have the pleasure this time to have pianist and composer Angelica Sanchez joining me to continue with the series. she is an amazing improviser and very active in the avant-garde scene since she moved to NYC back in 1994. we'll be starting our set at 8:30pm on Friday Jan 25th. I will be curating this at iBeam monthly or every other month... so please stay tuned! also, if you happen to be a pianist feel free to contact me via email if you would like to join at future concerts. the more, the merrier. -big thanks to Brian Drye at iBeam for accepting the challenge and kindly supporting my initiative from the start-. also, in the new year I will be going into the studio with my Trio in late January at Oktaven studios in Fordham, NY. thrilled to make it happen and record new music. I am making this recording with Drew Gress on bass and Devin Gray on drums. Jeremy Loucas will be in charge of the sound again this time... really looking forward to this! later in february my friend and bassist Masa Kamaguchi based in Barcelona will be in NYC after a year... I'm excited to play with him again! I am thrilled this time the amazing drummer Gerald Cleaver will be joining us for our set. finally, I am also happy to share recent news that DownBeat Magazine has listed my last album, Live At iBeam by Ditmas Quartet released back in the summer on Fresh Sound New Talent, within the Best Albums of 2018!!! thanks for reading & happy new year. My latest album "Live At iBeam" by Ditmas Quartet released back in mid July 2018 on Fresh Sound New Talent got 4 stars! on DownBeat's November issue... again no publicist. Really proud and excited about this project and all my efforts… wonderful review!! 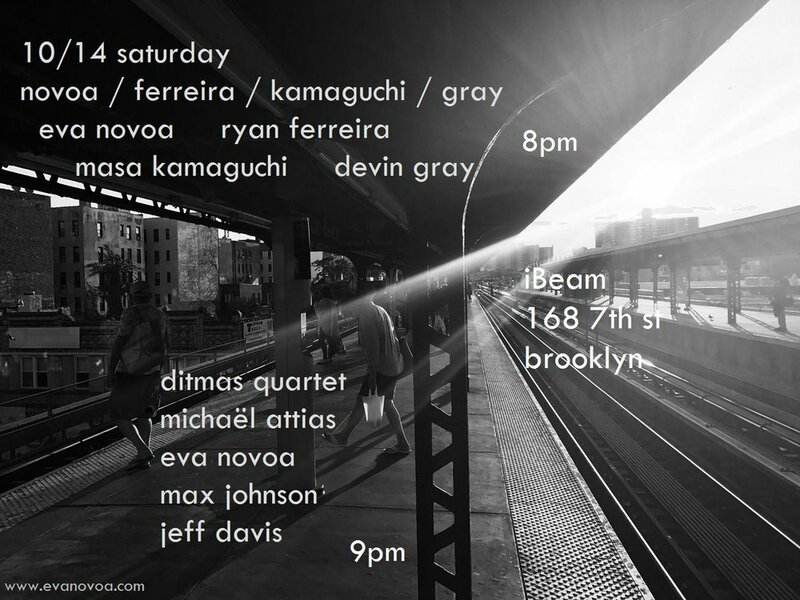 “ A wonderfully wild, moody, collaborative and improvisational set by Spanish composer Eva Novoa’s Ditmas Quartet was recorded live during the summer of 2016 at Brooklyn’s IBeam, home to experimental and innovative new works. Opening with the pensive “Déjà Vu,” its escalating intensity lent by Novoa’s piano and drummer Jeff Davis, there’s something familiar about the quartet’s approach to free-jazz, at once feeling its 20th-century origins and free of them. Contrasting with Novoa’s striking and inventive playing, saxophonist Michaël Attias lends his arresting style to the set’s stand-out performances: the haunted and dramatic “Enough,” the angular study of “Why You Here” and the pleasantly quirky “Yela.” Bassist Max Johnson stands out on “Walk On The Moon,” as he keeps it floating on the solos until Davis finally tips in and the quartet brings home the set’s penultimate and climactic number. I am currently writing new music which I will also play in a special solo set up this time, for your ears only... and Randy Thaler's ears too, as he is going to be recording both sets. I will be curating the night at iBeam. Kenneth Jiménez Trio will play the second set... Kenneth plays the bass and writes cool music. he is bringing a great band. here are further details and other interesting concerts of mine that I am excited about in the coming weeks and months... music, music, music... isn't that why we are ALL here?! also! my next album -fourth album as a leader- Live At iBeam by Ditmas Quartet just came out two days ago!! it is released on Fresh Sound New Talent. mixed and mastered at Sear Sound in NY by Jeremy Loucas. it is also part of this music announcement: you will see the details further below... just scroll down & click on the FSNT link at the bottom. more details & updates related to this wonderful project and band coming soon... stay tuned! So excited my next 4th album as a leader and Ditmas Quartet's 2nd album as a band is coming out shortly next month on Fresh Sound New Talent! July 15th. This time I will be performing with two of my favorite players. My friend Manel Fortià from Barcelona and the great Billy Mintz, who doesn't need further presentation. Every time I get to play with Billy it is special indeed. Here are the details. I am curating Arturo Garcia's project, an adaptation and music arrangement he has made from the film score of the movie Santa Sangre (a surreal thriller by Alejandro Jodorowsky). This is Arturo's adaptation for a 10 musicians ensemble. Arturo Garcia is a wonderful composer, drummer and percussionist from Venezuela based in Miami, FL. He plays in different bands and currently tours nationally in the US with his project Cave Of Swimmers. Thrilled and honored to present his special project at iBeam! I will perform duo with the great Michaël Attias on alto sax. Please join us for a truly special night! I am really excited to play for the second time with this Japanese rhythm section. This concert will be recorded live. thrilled to play with this wonderful trio again!! & say happy new year! Please join us for a very special night and set at IBeam. Excited to play with Tom Rainey on drums, Hery Paz on tenor sax and Kenneth Jiménez on bass. Art and flyer by Hery Paz. really excited to play this great double bill!! Psyched to play with this incredible dream-team rhythm section!! Please join us and support live music! Please join us and support live music! !